We all want to have a beautiful, bright smile. But over the years, our once bright smile can get discolored, which can be accelerated by drinking coffee, red wine, or other colored beverages, eating berries, eating pasta sauce or smoking. Because so many Monrovia patients have seen their teeth yellow over the years, teeth whitening has become a popular procedure in our office. 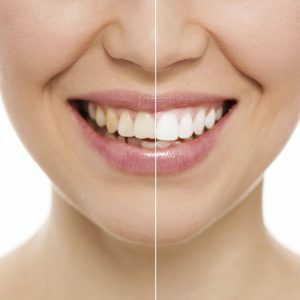 But many people who contact our Monrovia office for teeth whitening have questions, such as “How long does teeth whitening last?” and “Is teeth whitening permanent?” Read on for a discussion on teeth whitening, including how long you can expect your results to last. Teeth whitening is a cosmetic dentistry procedure that is painless and performed without any anesthesia in our Monrovia office. The process starts by placing gel-filled trays (that contain a mixture of hydrogen peroxide and bleach) into your mouth. After the trays are inserted, a bright light is shined into your mouth to speed up the bleaching process. The gel-filled trays are removed after about 20 to 30 minutes – depending on the shade of white you are trying to achieve. In all, the teeth whitening process lasts about an hour. Unfortunately, teeth whitening is not permanent. The length of your results will depend on your unique case, but typically teeth whitening can last anywhere from a few months to 3 years. There are many factors that can affect your results, such as the type of staining, the thickness of enamel on your teeth, drinking colored drinks like coffee, red wine or sodas and smoking. You can also maintain your newly brighter smile by drinking plenty of water, practicing good oral hygiene by brushing your teeth twice a day and flossing everyday and by coming in for your bi-annual teeth cleanings. We know your goal is to keep your teeth white and bright all year long, but Monrovia dentist Dr. Q doesn’t recommend that you overuse teeth whitening. Instead, she will work with you to come up with a teeth whitening schedule that meets your particular needs and situation. Children under age 16, whose teeth and roots are still developing. Monrovia patients with certain oral health conditions, including gum disease, thin enamel, cavities or infections. Many patients suffering from one of these conditions can undergo teeth whitening once these other dental issues are resolved. Are There Any Risks to Teeth Whitening? Professional teeth whitening by a dentist is generally a safe procedure. But there still are some slight risks. Some patients may have sensitivity or pain after teeth whitening. But typically, this goes away within a few hours or days. I Want to Get My Teeth Whitened. What Do I Do Next? If you’re ready for a teeth whitening procedure, contact Dr. Q’s Monrovia office at (626) 599-9818 to schedule a consultation. During your consultation, Dr. Q will perform a full examination of your teeth and gums to confirm you are a good candidate for teeth whitening and explain the teeth whitening procedure to you. After that, we will schedule your teeth whitening appointment, and you can leave with a brighter smile.